A time and labour-saving range of Enerpac Sync Grip Pullers that enable one person to safely handle many jobs previously requiring two will be highlighted at the EMEX 2018 engineering machinery exhibition in Auckland from May 1-3. The SG puller range – in mechanical and hydraulic capacities up to 45 tons – will be a highlight of the joint Jonel Hydraulics-Enerpac stand 232 at EMEX, which will simultaneously feature Enerpac’s go-anywhere XC cordless pumps, offering the performance capabilities of an electric or pneumatic powered pump with the convenient portability of a hand pump. XC cordless pumps are constructed of lightweight materials, equipped with a powerful, one-half horsepower motor, and feature 28-volt, Lithium-Ion battery technology. Used with Enerpac’s global range of lifting, forming, crimping, cutting, fabrication and maintenance tools – including hydraulic SG pullers – they promote operator safety by removing trip hazards associated with traditional powered pumps. SG pullers – which feature synchronised movement of their locking jaws for simultaneous engagement and optimised safety – can be used as a standalone tool or hydraulic units can be combined with the cordless pump to deliver outstanding safety and convenience, particularly in hard-to-access areas. 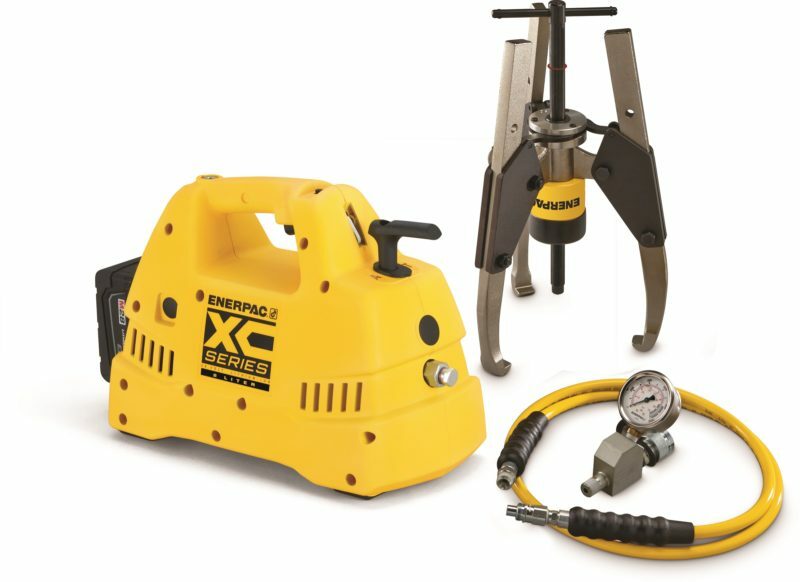 “The XC/SG combination is ideal for a wide variety of common maintenance tasks either off-site or in workshops where operations staff appreciate the power and precision of safety-first hydraulics that are easy and convenient to apply to sometimes less accessible and potentially hazardous jobs,” says Enerpac New Zealand Country Manager Mr Neville Stuart. SG-Series Sync Grip Pullers optimise safety, simplicity and speed of removal of bearings, bushings, gears, sleeves, wheels, fly-wheels, sprockets and other shaft-mounted items. They enable one person to do jobs that often previously took two, in applications such as maintenance of fixed and mobile machinery and plant as well as heavy vehicles and rolling stock in industries such as the automotive, construction, civil, mechanical, production and process engineering, manufacturing and metal working, mining and energy, oil and gas, materials handling, primary production, road, rail and tracked vehicle transport, water and wastewater industries. When one jaw is closed around the bearing surface, the others automatically close at the same time, making the puller easier and safer to operate. The synchronous feature of the SGM (mechanical) and SGH (hydraulic) Series Pullers makes positioning the puller simple. A safety and workplace benefit of SG pullers is that they will grip even on surfaces where normal pullers would slip off – for example, on tapered bearings. “Their, smooth, simple and safe operation means that, instead of impact hazards created by removal methods using hammers and levers – with risks to both the workpiece and maintenance personnel – Sync Grip Pullers draw parts smoothly and precisely without the need for heating or prying,” says Mr Stuart, who will be on hand at EMEX to provide guidance on Enerpac tool use. He will also introduce specials on purpose-built sets that will be offered for products on display. Sync Grip Pullers are the latest evolution of Enerpac’s advanced puller technology, while XC pumps are part of Enerpac’s extensive hydraulic pump ranges with reliability and service backing throughout Australia, New Zealand and PNG.